I can imagine the conversation taking place between the two people that bother to show up at my funeral (it would be an exclusive event). “In the end, it was all that coffee that got him”, the first will say. “He couldn't put two and two together”, the second will offer, nodding. “And he played a lot of Zelda like games”, the third would contribute rather dramatically. And you know what? They would all be right. Especially the second person on my ability with math. And I do like my Zelda-like games; they were never my top favourites, but that escapism formula comprised of puzzles and combat challenges that get beautifully wrapped up with a story on top does clock a lot of my time upon this earth. It must be doing something right. All of which is my typically long way of saying Mages of Mystralia is yet another Zelda like game, not that there’s anything wrong with it, that does what all the good Zelda like games do well. Yet in our world, saturated with games as it is, a game needs an ace up its sleeve in order to stand above the rest. Mages of Mystralia brings three such aces to the table, to which I will add a bonus fourth: Firstly, it is packed in a super lovely presentation; secondly, it offers a unique spell crafting mechanic, of the type that makes one ask “how come they haven’t done that before”; and thirdly, its story was written by the guy who wrote the Forgotten Realms universe for Dungeons & Dragons; Ed Greenwood. Respect! In case you were wondering about that fourth bonus ace: Mages of Mystralia was brought to life by a Canadian indie development studio. Out of respect for everything it takes to produce a well polished game, I will always take a bow before an indie developer. Bonuses out of the way, let’s peek at those magic aces one by one and see if they are enough to win a round with. Getting my hands dirty with this review (perhaps I should clean that controller? 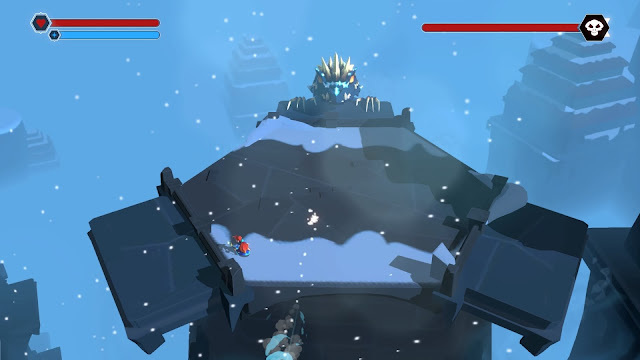 ), the first thing I took note of with Mages of Mystralia is its looks. The lovely color palette, the cute rounded graphics, all work together to create a very pleasant visual experience. Mystralia’s is thus, very obviously, a world I could happily sink dozens of hours of pleasant gaming at, thank you very much. It is exactly what the doctor prescribed in terms of rest and recuperation following a tough day at the office. 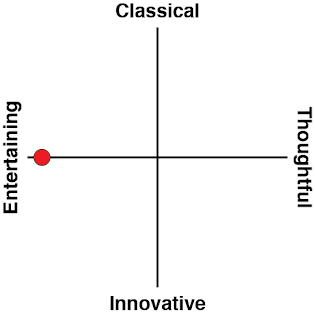 Sure, the presentation is not the most technically demanding, but who cares? It works, and it looks gorgeous! Then there’s that unique spell craft mechanic. You see, as the player, you don't simply learn new spells; you actually craft them of multiple components (or runes, to use the game's language) that you stumble upon through your adventures. The beauty of it is that you can mix and match as per your needs. To use the example the game starts with, your character starts off with a fire spell that you can light things with; once you add a "move" rune to that spell, that fire becomes a fireball, which is obviously a useful ranged weapon; and once you add a "right" rune to the latter, that fireball becomes a right turning fireball that you can use in order to solve a certain unique puzzle while still using the former fireball spell to engage enemies with. When I think about it, this mechanic makes perfect sense; it's like Darwin's Theory of Evolution, so blatantly obvious that one may well take it for granted before wondering why no one had ever thought of it before this Darwin dude came along. Yet the Theory of Evolution had to wait for Darwin, while this lovely spell crafting mechanic had to wait for Mages of Mystralia. No one ever said the world we live in needs to make sense. Problem is, not all that is shiny is gold. That new mechanic could be Darwin's Theory of Gaming Incarnate, but its implementation is not as brilliant. It tends to feel as if the mechanic is forcing itself on the game; a gimmick. 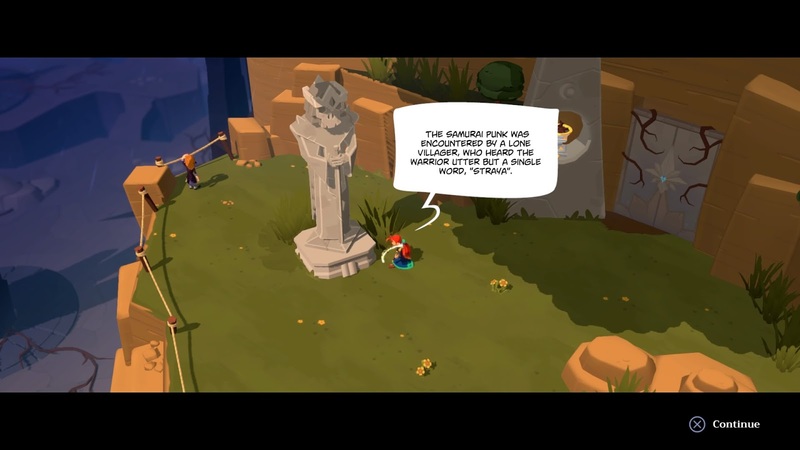 It is as if Mystralia managed to misinterpret Chekhov: in Mystralia, if a rune is introduced in the first act, the player should expect to need to use it within a minute and a half. True, that is not always the case, but that was the impression the game left on me. Call me a conservative, but I think I actually prefer the simpler crafting mechanics of yesteryear. Oh yes, there is a game in there, too. 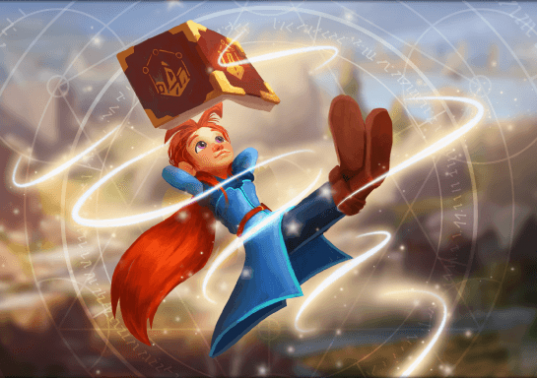 As you might have guessed, Mages of Mystralia has you playing as a mage; Zia. A young female mage, actually. The exposition tells us that the once powerful mages have been marginalised following a big war with the trolls, but now the new kid in town - Zia - needs to accept the new powers that came to her attention and follow the pretty linear plot specified by her would be trainer. On her way there she collects coins, fights pop up goblins and such along the way, and crashes many a vase; regrettably, these aspects of the game felt far too Skylanders like to me. Perhaps to counter that, the boss fights felt like that page from the Nintendo book was carbon copied. Eventually, Zia will unravel some plot twists, too. 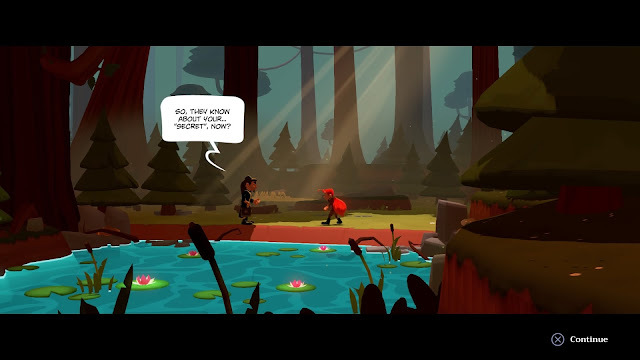 What I am trying to say here is, despite the big story credit coming through its writer's credentials, Mages of Mystralia did not feel to me like a narrative driven affair. Yes, there is a story in there; no, it isn't a bad one; but it definitely was not of a calibre that magnetised me to the game. No, that role was mostly filled by the puzzles, which come in all sorts of flavours. Some are pure brain teasers, often (but not always) utilising the environment and/or that mechanic I went on about. Others require speed (I hate those! ), and the remainder tend to involve fighting. None of these puzzles will revolutionise one's perceptions of video game puzzles, but they were definitely of the type that made me go "I just need to do this one" followed by "why does the clock say we're already in the AM, didn't I just finish dinner?" Map exploration in order to solve the next puzzle is thus the engine running this game. Many of the puzzles turn out to be bonuses, though it is not that clear cut when you're actually performing them. There is also a lot of backtracking involved, with the game occasionally informing you quite explicitly that, no, you do not have the runes required in order to solve a particular puzzle. Related reading: For a second take on the game, you can check out Ginny's review of the PC version here. Given all that is said and done, what is my recommendation to you with regards to Mages of Mystralia? 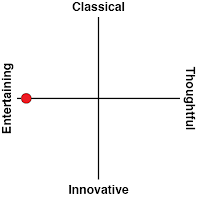 I would define this game as a nice game that was very well cooked and served. No, it wasn’t one of those rare breed that practically forced me to sit and play. Mystralia's is a more down to earth experience, gaining most of its credit through its adorably vivid presentation. 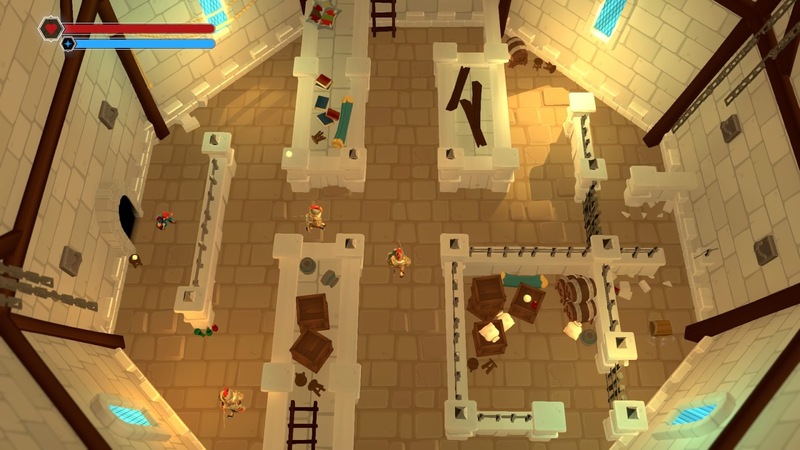 It also does very well in the puzzle department, regardless of that unique mechanic; given how often the original Zelda games manage to frustrate me and/or noobishly send me to YouTube for advice, Mystralia's world is that of fine, refined escapism. That's a mighty fine achievement by me that just might apply to you, too.